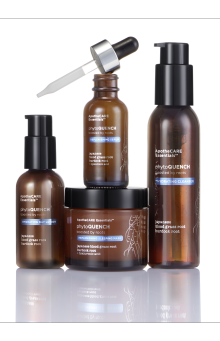 PhytoQuench hydrating serum, boosted by roots and hyaluronic acid, replenishes skin's moisture reservoir to provide continuous hydration for more supple, dewy and radiant skin. 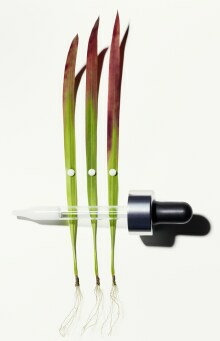 Japanese Blood Grass, included at active levels, is known as a survivor plant. Its roots trap water and hangs on to it, maintaining appropriate hydration even in sandy or salty environments. 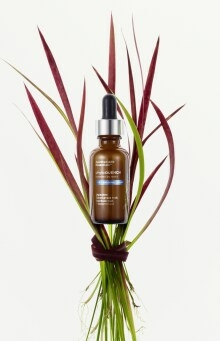 Apply the hydrating serum morning and evening over face and neck. A featherlight and dewy formula, leaves skin with velvety finish. Follow up with PhytoQUENCH Hydrating Day Lotion. 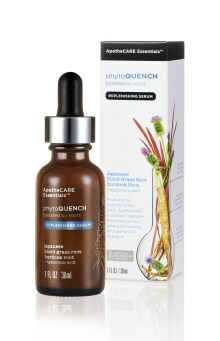 PhytoQuench Replenishing Serum is rated 4.4 out of 5 by 71. Rated 5 out of 5 by Willamil from Serious Serum! The PhytoQuench Serum is replenishing and hydrating and is an absolute pleasure to use on a daily basis before I apply the day lotion. It also contains targeted ingredients and my skin responded quicker and more effectively when I used the serum and lotion together. My routine is to use the cleanser, then the serum (neck too) and then the lotion. A simple routine with advanced benefits due to the “natural” technology. I have mature skin needs and I found my answer. Pro tip: Every once in a while cocktail the day lotion with the serum and create a leave-on mask! I received this product free for review purposes. Rated 5 out of 5 by Kelly8123 from Very Hydrating I received this serum complimentary from Influenster, but below is my honest review. I have very dry, flaky skin, especially in the winter months and it’s diificult to find products that actually hydrate. I tried this serum not expecting much, but was very pleasantly surprised. The serum is nice and light and it only takes a few drops to cover the entire face. Used along with moisturizer my face felt hydrated the entire day. After a week or so of use I noticed that my skin was more hydrated and that I was using less moisturizer overall. I think this product is more in line with serums costing twice as much and it’s a steal at its current price. I would definitely recommend. Rated 4 out of 5 by Amanda J from Love it, with a little mixology!! 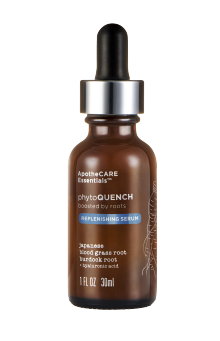 I enjoyed the Apothecare Essentials Photoquench Replensing serum! I received this item from #influenster for free in exchange for my honest review. I have been using this serum for the past three weeks. To be honest, I expected a more liquid like serum, but thick lotion like substance was so wonderful! Plus the packaging was very fancy, which is fun! A good #PROTIP for my dry sisters and brothers would be to mix a few drops of Argan, Marula or Rosehip seed oil and mix with the serum. I had amazing results with a little dab of oil!!! I will absolutely purchase this when mine runs out! It is lovely! Rated 4 out of 5 by Brinseri from One squirt is all you need I've been using this serum along with the cleanser and moisturizer for about 4weeks. I received the products from Influenster in a Voxbox. I love how all you need is one squirt to hydrate your full face a neck. It stays on all day and helps your face to stay smooth. During the winter my face tends to be a little more dryer so I did use 2 squirts of lotion once a week. These products have a pleasant scent, however, I am lucky I do not have scent allergies as these products do have a strong perfume smell. Also there are strong warnings not to get the products in your eyes. I like a product that is safe for all facial parts. However, I did not ever get it in my eyes to know what would happen. Rated 4 out of 5 by Mystemae37 from Skin feels great, amazing scent! This serum is amazing! I have been using it fully for two weeks. Morning and night. I apply after using the hydrating cleanser in the same line. The scent of this serum is truly wonderful. I feel like I am at a spa when I apply it. A little is all you need. Spreads very well, and absorbs quickly. I feel that the fine lines around my eyes and forehead are slightly less pronounced. So with continued use hopefully will only get better. I only have four stars because by the end of the day my skin can be a little oily; however, I use a BB Cream for my foundation so that may be the cause. Overall, I love it. And i will be purchasing when I run out. I received these products complimentary for testing purposes. Rated 4 out of 5 by Daisies803 from Loving this serum! I am really loving this serum. I received the serum complementary and my Influenster Voxbox. For the last 2 weeks, I have only used these products. I was a little hesitant not to use my Anti-aging products but I really haven't missed them. 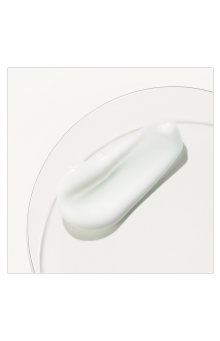 The serum has a very mild fragrance, it's a very pretty creamy white, and a little bit goes a very long way. I have felt my skin has been very moisturizing and nourished by this product. I often go without makeup, and this is giving a nice smooth overall appearance to my skin. After applying the serum my face is so soft soft. Love it! Rated 4 out of 5 by Jamie B from Super Hydrating This is a really great hydrating serum for all skin types! I have used this serum for a month now my skin is soft, plump, and completely hydrated! A little bit goes a long way so this would last awhile that's for sure. I'm not a ingredient nut so I can't talk about anything like that, I can only speak to if it works or not. Which it does just what it says my skin was dry and hating me from winter time so this was a welcome relief. My skin is just glowing! The only thing I didn't like was to smell it smells like u walked into an apothecary shop which I don't care for. It doesn't stink it's just strong an not my favorite smell! I received this product free for my honest review from influenster and apothecareessentials! Rated 5 out of 5 by Mwright428 from My skin is so soft! I received this complimentary for testing. Combined with the moisturizer and cleanser, this is an amazing, affordable regimen! The serum is kind of a milky consistency. I did use 4 drops for face and neck. After applying I used a damp beauty blender to really press the serum in to my skin. Then waited about a minute or two before applying the moisturizer. With this winter cold my skin was angry, after two weeks using this regimen I notice a Huge difference! It's soft, pores are smaller, tone is more even! I will definitely be continuing use of these products!